Archimedes was a Greek mathematician, physicist, engineer and inventor of the 3rd century B.C. and is considered one of the greatest mathematicians of all time. He was born in Syracuse, Sicily and the year of his birth is estimated to be c. 287 BC by historians. Very little is known about his life as his biography, written by his friend Heracleides, was lost. Archimedes’ father was named Phidias and he was an astronomer, as Archimedes makes a reference to this fact himself in one of his works. He might also have been related to King Hieron II of Syracuse, and one of his books is even dedicated to Hieron’s son Gelon. 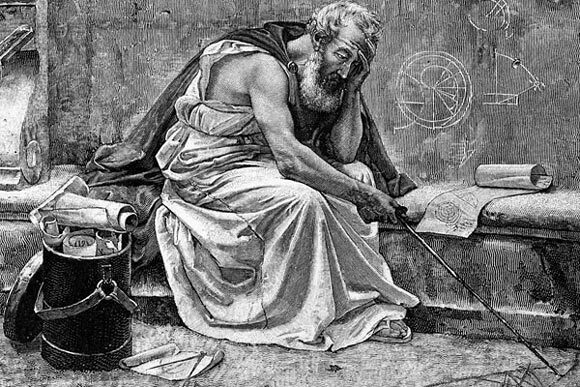 Archimedes went to Alexandria to study at the school established there by the Greek mathematician Euclid. There was a huge library at Alexandria built by Alexander the Great’s successor, Ptolemy Lagides. Many learned scholars came to meet and hold discussions there. It was here that Archimedes met Eratosthenes, who was a talented mathematician and in charge of the library. Other than this, however, very few personal details are known about Archimedes’ life such as whether he was married, or had children. Archimedes believed in acquiring knowledge for the sake of learning itself, and not for any practical purposes or monetary gain. That being said, he was often employed in designing contraptions and machines during wartime as he was a fantastic engineer and solved many practical problems for the king. One of the most famous of these was the problem of discerning whether the king’s crown maker had forged the crown by mixing some silver with the gold. Although the crown weighed the same as the amount of gold used to make it, the king was still suspicious and asked Archimedes to come up with a solution. Archimedes pondered over it and finally figured it out while he immersed himself in a bathtub and noticed the water being displaced by the weight of his body. He was so excited at having come up with the idea that he reportedly ran out of his bathtub and shouted “Eureka!” meaning “I have found it!”. Using the same principle to measure the density of gold and silver, Archimedes was able to ascertain that the crown had indeed been forged by mixing some silver with the gold. He called it the “Archimedes’ Principle” and it is used for calculating the volume of objects with irregular shape. Archimedes also designed clever machines to be used during wartime. One of these was a “claw” used to lift attacking ships out of the water, another was a catapult to hurl heavy stones from a great distance. By some accounts he even used mirrors and the reflection of the sun’s rays to set fire to approaching enemy ships from a distance. Some of his other inventions include Archimedes’ screw which was a machine for raising water from the ground and bringing it to the fields. Using a system of levers and pulleys, Archimedes was able to design many astounding machines that were way ahead of the times. Despite his mechanical capabilities, however, his true passion was mathematics and he made many astounding advancements in the field. He continued the work of Euclid, devised a method to determine the areas and volumes of figures with curved surfaces, estimated the value of the pi more accurately than had ever been done before and made immeasurably important advances in integral calculus. The exact number of works written by him are not known, nor have many of them survived but we know enough to consider him a legendary and unrivaled mathematician. He was killed by a Roman soldier during the invasion of Syracuse and is believed to have been 75 years old at the time of his death.